Camping is my all-time favorite summer activity and no trip is complete without s’mores! 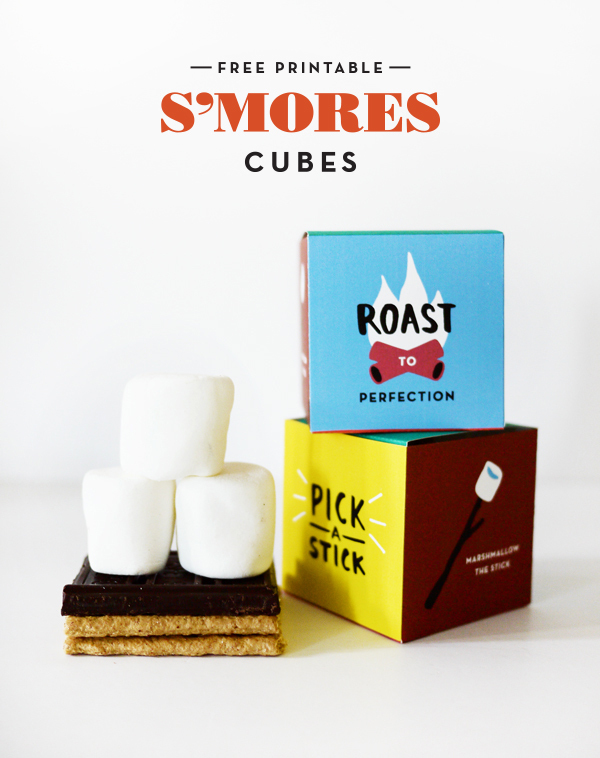 These fun little instructional cubes make the perfect treat for a summer bonfire or camping trip. They even fit two marshmallows just in case you need a snack while the other is roasting over the fire. 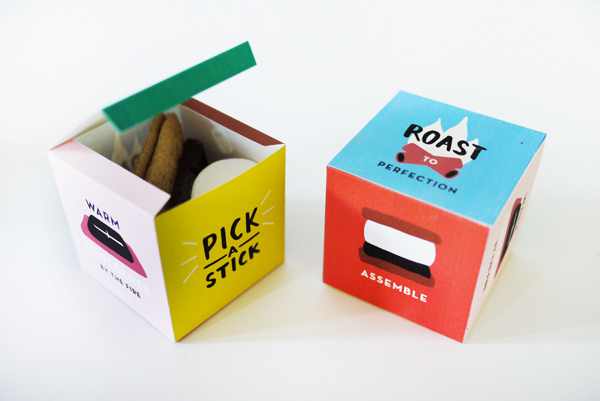 If you need to serve a larger audience be sure to check out these s’more kits. 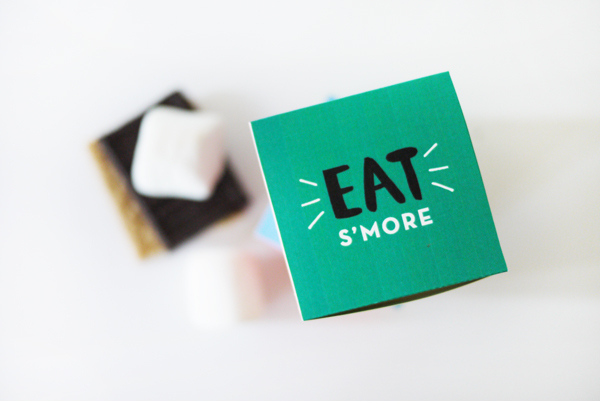 Step 1: Print out the Printable S’mores Cube template on 8.5 x 11 card stock. Step 2: Score all of the indicated fold marks using a bone folder & straight edge then cut out template with the craft knife. Step 3: Fold the box along all of the score marks using the bone folder. Step 4: Apply glue to all of the tabs on the bottom of the box. Don’t apply glue to the top tabs of the pink and brown sides or the green side (that will be the top of the box). Step 5: Assemble the box and wait for glue to dry (see pictures). Use the bone folder to secure down the tabs from the inside of the box. 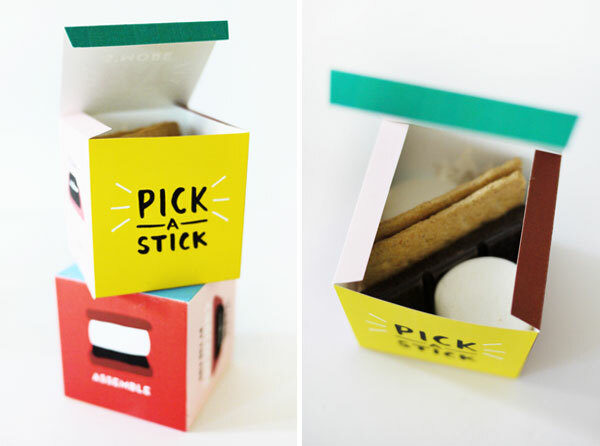 Step 6: Add graham crackers, chocolate, & marshmallows to the box and close the box. Step 7: Find a fire & get roasting! Such a cute thing! So perfect for a cookout party!! I wish I was back in America by a bonfire having s’mores! These are too cute! These are so cute! They would be perfect as party favors too!